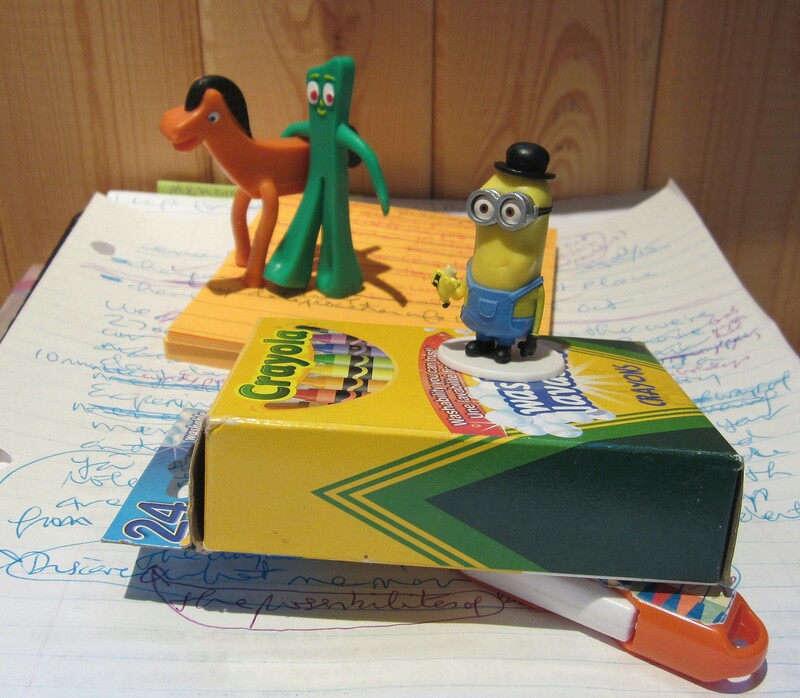 My studio work table has been invaded by Minions. Well, one Minion, to be precise. His name is Kevin. He is eating a banana and smiling, his yellow cheeks bulged out on one side. Evidently it’s a good banana. Kevin is only two inches tall, but his effect on me is in the exponential multiples. You know, ten to the millionth power plus. Kevin makes me smile. Makes my insides laugh. He gives me joy, every time I look at him, standing there on my projects pile. His smile is pure smile. There’s nothing behind it and nothing attached to it. No agenda. Very simply, he’s happy and he’s letting me know that. I love it when I meet someone who is pure smile. Not only their mouth smiles. It’s all over their face and all over their body. They are unabashedly happy and they are radiating that happiness like an August morning sun. Brilliant. Blazing. You can’t not feel it. Smiles like this, full body smiles, are contagious. I meet someone who is smiling full-on, and next thing I know, I am beaming back at them. No matter how I feel before I meet them, they change me by the time we part. We don’t even need to stop and talk. I can pass them on the sidewalk, share smiles, and be changed in seconds. That’s how powerful we are, when we are in full-on, pure smile. We can change the world. Just by smiling. Go for it, Kevin. Show me your smile. Invade my world.